Frimley (Camberley), Farnborough, Fleet, Farnham. Whoopee Motor Factors Ltd started trading on the 4th August 1975 43 years ago, and during this period has grown to four depots these being situated in Frimley Green, Fleet, Farnham and Farnborough. 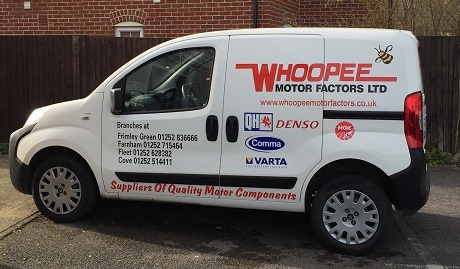 Whoopee Motor Factors Ltd offer quality motor components and accessories at competitive prices coupled with experienced, friendly and knowledgeable staff together with an efficient delivery service to the trade from each depot aiming to achieve deliveries within the hour. We pride ourself on the service we provide to our trade customers and we’ve a fleet of delivery vehicles which endeavour to deliver within the hour. Account facilties are available to the trade on completion of account application forms which can be obtained from any of our depots or from our accounts department at our head office. What type of car parts do we stock? A large comprehensive range of parts is stocked for British, Foreign and Japanese vehicles at each depot and non-stocked items can usually be obtained for delivery the same day. We also stock a full range of accessories, lubricants, fluids, polishes and other car products. Click ‘here’ for a list of parts stocked. Classic vehicle parts, although becoming harder to source, we endeavour to obtain form our list of specialist suppliers. In many cases these parts may even be on the shelf in one of our four depots.